Cops Probe Junior High School Student's "Hit List"
Students, parents and staff at a Northwest Indiana junior high school are worried after learning that a student was discovered with a "hit list." 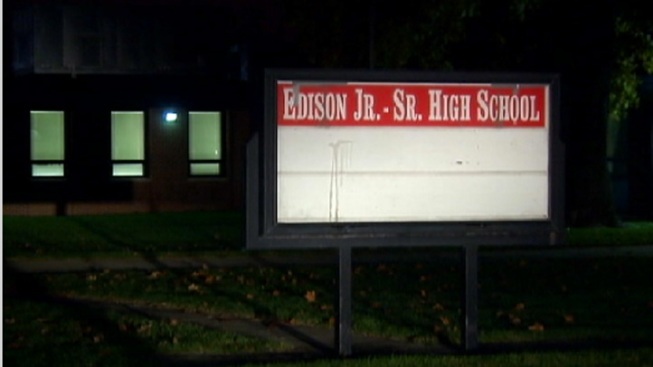 The student had only been at Edison Junior-Senior High School in Lake Station for a month when the list was discovered on Oct. 24. Twenty students and several teachers were on the list. Officials aren't clear exactly what the student meant by a "hit," but the ninth-grader was expelled and police would like to speak with him. Police said Lake Station officers responded to Edison High School around 11:00 a.m. on Oct. 29 after threats were reported at the school. School officials told police two students approached them on Oct. 24 after they heard a 15-year-old student was compiling a "hit list" of names. The witnesses said they saw the list and noted it had several students' and teacher's names on it. The students took photos of the list with their phones and turned it over to school administration, police said. "I was scared," said eighth-grader Ashlee Prince. "I was on the hit list and didn't' know what to think." "My heart dropped. It was a scary thought that I was on somebody's hit list," senior Caitlin Prince said. The targeted students say they barely knew the student accused of creating the list. Police said the student suspect was brought into the school's office and searched after the report and admitted to school staff that he had a list, but had thrown it in the garbage. Parents were just informed about the list on Thursday, and some are upset that it took so long for them to be notified. "As a school, they have an obligation to tell parents. Even if only first names on the list, they could have sent a newsletter to the parents that day notifying us of the issue, but they didn't," parent Connie Prince said. Event though the student has been expelled, the targeted student say they don't feel safe -- or their parents. "At this point, I don't feel safe sending my children there because no one knows where this kid is," Prince said.